Christmas is coming! So I decided to do a post about what I did for Thanksgiving before it’s way too late. I burned it a little bit, but it was still so moist inside! The written recipe is here. I like the Jalapeno sauce. It’s a great substitute for ssamjang sauce (the sauce used for bossam) if you can’t get the real ssamjang sauce. The ginger and scallion sauce was a bit too oily for my taste. Maybe because I used cheap vegetable oil. I added a bit of sesame oil to remove the overwhelming oily flavor, and I basically just scooped the scallion and put it on my pork. I cheated and used sushi powder to make sushi rice though. I got an 8lbs pork shoulder for about $9. My boyfriend and I ate it like regular bossam couple of times, and ate it with ramen (just like they did in the video) a couple of times, and there was still a LOT of it left! Just out of curiosity, I made a roll with it. 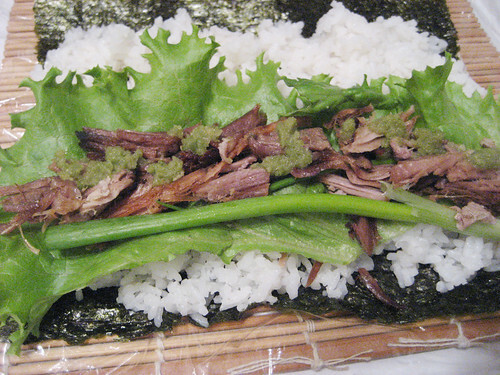 Seaweed, sushi rice (seasoned with vinegar and sugar), lettuce, pork, scallion and left over Jalapeno sauce. 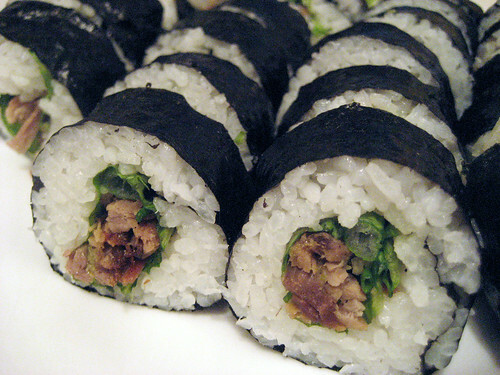 I ate it with soy sauce and wasabi like a regular roll and it was pretty good! 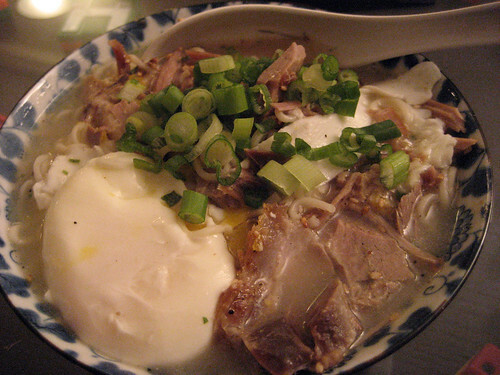 I used pretty much the same ingredients I used for the bossam. 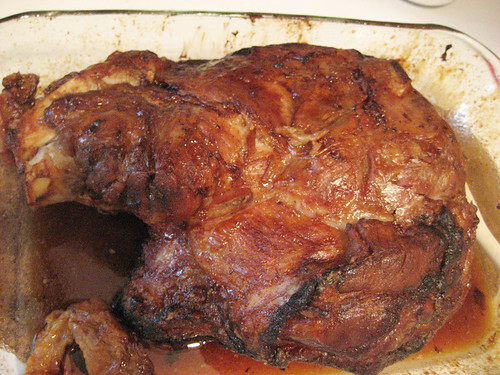 For two people this pork shoulder lasted a little more than a week. We didn’t really try to eat it for every meal though, actually. If you keep it in an air tight container, it’ll stay soft when you heat it up. As you can see it in the video, if you buy a pork shoulder with skin, you’re going to have to remove a lot of skin. I could only find pork shoulder with skin, and it seemed like a lot of waste to just throw it away. 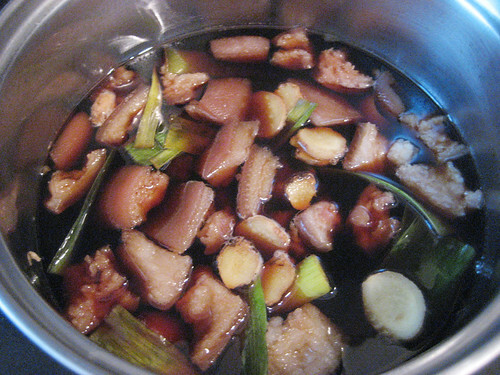 Besides, pork skin contains a lot of natural collagen, and it’s considered a beauty food in Japan. 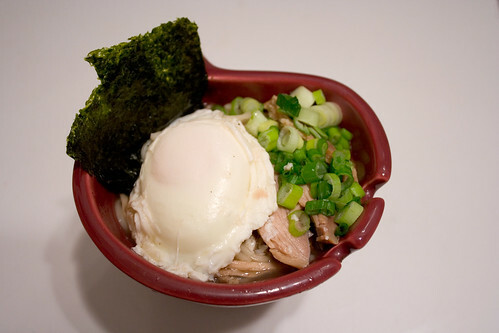 A couple of minutes of googling in Japanese, I found a recipe. There are some Asian ingredients, but you’ll probably be able to find them at an Asian food section in a super market like Whole Foods. *the original recipe had twice as much as ingredients, but after I cooked it, I realized that the half of it should do just fine. All you have to do is cut up skin into smaller pieces, and boil it with all the ingredients in low heat for 30 minutes. That’s it! The hard pork skin will become very soft. The soup is just to season the pork skin, so you don’t actually eat it, but if you aren’t eating the pork skin right away, put both the pork and the soup into a tupperware and keep it in the fridge. If you put it in the fridge, the pork fat will harden on the top, and the whole soup will be very jelly but don’t worry, that’s how it’s supposed to be. You can just take pork skin out, heat it up and eat or use it. You can eat the pork as is. It’s a bit salty by itself, it’s more like a side dish than a main dish. 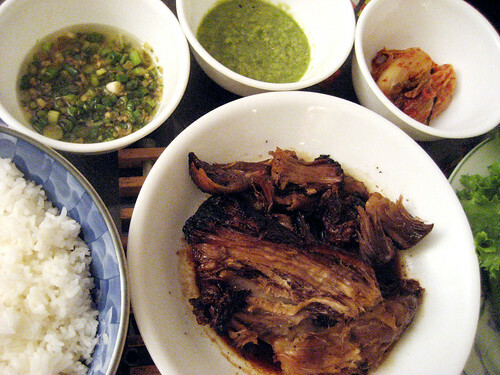 But you can also make it into a main dish cooking the pork skin with other food. 3. Put vegetables in and stir fry. 4. Put pork skin in and mix it well with vegetables. 5. Pour cooking sake in, and let the alcohol evaporate. 6. Put oyster sauce and soy sauce mix it well. I think baby corn and water chestnuts will also go well with this dish. 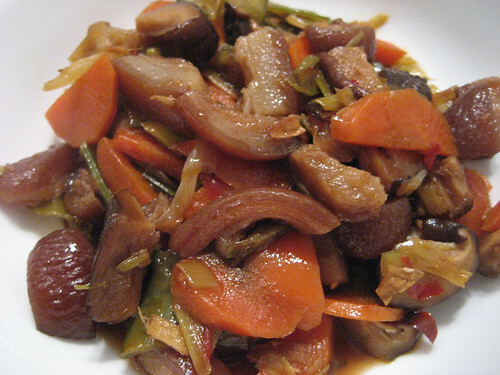 You can just throw the pork skin into pretty much any stir fried vegetables. Make sure you visit “Hungry Nation: Real people. Real food.” for more affordable & easy & delicious food! You sure do know how to make a guy hungry!! Too bad I live in an in-law and my “kitchen” is equivalent to an office break room! That looks pretty simple. But time consuming. The ginger scallion sauce does seem overly oily. When I want those flavors, I just stop at the sesame oil. No extra neutral oil or anything. wow! my mouth is watering and it’s only morning, delish! Awesome! Thanks for taking the time! Well done.